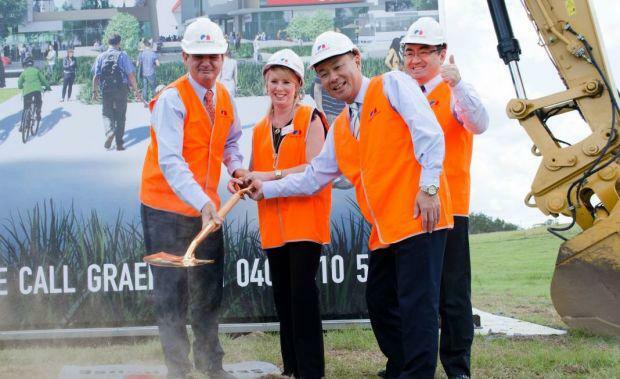 Sekisui House commenced construction on Stage 1 of the $1.5billion Ripley Town Centre at Ripley Valley. Ipswich City Mayor Cr Paul Pisasale joined Sekisui House Australia CEO and Managing Director Toru Abe to turn the first sod. Stage 1 is on schedule to open in 2017, providing a 3,800 sqm full line Coles supermarket, 20 specialty shops and a medical centre. Mr Abe said Ripley Town Centre would be the primary town centre for the Ripley Valley, and Stage 1 would deliver a number of key services. “On completion Ripley Town Centre will service 120,000 people and offer 257,000 sqm GFA – approximately 40 football fields – providing retail, commercial and community space,” Mr Abe said. “As the primary town centre for the Ripley Valley region, Ripley Town Centre will deliver a major regional shopping centre, a transit centre, health and education facilities, cafes, restaurants, parks and community facilities to cater to the region’s projected population of 120,000 people over the next 20 years. "As part of Sekisui House’s commitment to upfront investment, more than $10 million is being invested in associated infrastructure which will include an upgrade to Ripley Road to improve links to the Cunningham and Centenary Highways. Ipswich Mayor Paul Pisasale said the turning of Ripley Town Centre’s first sod was a huge milestone for the Ripley Valley region. “Ripley Valley is going from strength-to-strength and its sustainable development will be a major contributor to population growth. By 2031 an estimated 442,000 residents will call Ipswich home,” Cr Pisasale said. Coles Regional Manager Tanya Travis said Ripley Town Centre would be home to the first Coles store for the Ripley Valley region. “It’s an exciting time for Coles to branch out into a new region and be a part of, what will be the go-to retail destination of the Ripley Valley,” Ms Travis said.